Collection defines the coming together of multiple accounts of different webmail services for scanning, preview, searching, & backup. Create a collection or open a recently created one which is helpful for an organized backup. Relevancy: When backup of an old webmail account is being processed a collection comes in great help. You can process the backup in parts according to the managed time like; first you can scan the account, and save the collection. Later you can backup emails by opening the collection and proceeding from the point you last stopped at. Relevancy: The variety of preview options are helpful for closely looking into an email and its header for the purpose of analyzing the source, IP, priority, and other such detailed information related to each email. This listing option makes it easier to view emails of all the different subfolders under their corresponding main (parent) folder. Relevancy: The feature is helps to avoid repeatedly switching between folders and subfolders to view emails within them. All you have to do is right click on the main folder and select the "Recursive Listing" option to list the emails of all corresponding subfolders under the main folder. Relevancy: Suppose, you need to backup only those emails that consist of attachment(s). In this case, you can provide a relevant keyword that matches such emails and use the 'Look For' option and select the Attachments checkbox. This way, only emails with attachments will get listed which you can preview and also create backup for. Relevancy: The benefit of having the option to create backup in multiple locally accessible file formats is gaining wider scope & offline access due to web based email backup. Naming Convention Options: A particular pattern to name the backup output can be chosen from the list of options. Note that the feature is applicable on all output formats except, Outlook PST. Folder Hierarchy Retention: Original order in which the folders arranged can be retained with this option. Importance of this feature emerges during analysis. Duplicate Email Entry Removal: On selecting this checkbox, webmail backup tool ensures that no duplicate email entry is included at the time of backup. Selection of Folder(s): Email folders to be converted can be selected using the checkboxes provided against each. This option makes customized email folder backup possible. Relevancy: The report can help you locate where the backup output was saved at after it was generated by the software, in case it is forgotten or confused with by the user. Trial version of tool will export 50 items & creation of 1 collection. Moreover the trial version scans the emails size up to 10 GB and allow adding 6 email accounts in a collection. The machine should be connected to Uninterrupted Internet Connection for downloading emails. Is it possible to backup emails that have attachments in it? All the emails need to be backed up but currently I just need to back those having attachments. Is there a way to customize the way backup is done? Click on Attachment attribute and rearrange email listing on the basis of attachments. Go to Search and look for Attachments and get only emails with attachments listed in the results. Select the emails using checkboxes provided against each. Right click and select export to backup selected emails. Can I backup multiple accounts of different email service providers? I have two accounts from which I need to backup emails. However, one is a Gmail account while the other is a Hotmail (Outlook.com) account. Is it possible to backup emails from both the accounts at a time? Yes, you can backup emails from different webmail services at a time and using a common collection. However, note that you will have to add each account one by one for scanning and email download to proceed with the backup. Where can I get the complete software manual? It isn't feasible for me to get in touch with the support department every time I have a query. Where can I get the complete software manual for instructions? On the software Menu bar click on 'Help' button and select Help Contents. You will be redirected to a web page which consists of the complete software manual in a categorized manner for convenience. I cannot find my collection at the path chosen to save it. What could be the problem? I chose the C Drive to save the collection but I cannot find any related folder created on the path. What could be the problem? Software by default creates a folder by the name of "CDTPL" for storing collection at the path selected by user. There is no problem. 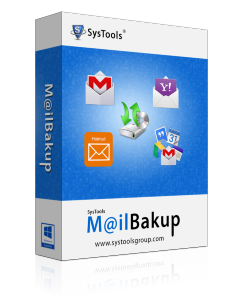 I used the Mailbackup tool for backing up my Gmail as well as Hotmail account. The process was made more convenient by a common collection to proceed with the backup. Convenience is the most strong point of the application as per my analysis! Great tool, thank you team SysTools! When I was told about this application by one of my colleagues I thought of it as just any other tool. But it proved to be quite different, in fact, unique; to be more specific. I liked search feature the most as I was able to customize my backup as per my convenience.